Leading 'contemporary miniaturist' Imran Qureshi has completed the latest Art on the Underground commission, celebrating 150 years of London's underground tube network. 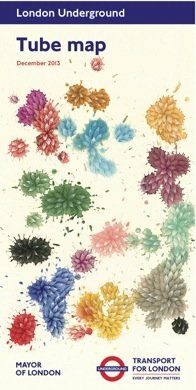 A new artwork by Imran Qureshi is the cover for the latest edition of London Underground’s Pocket Tube Map. Launched this month, All Time Would be Perpetual Spring is the final commission by Art on the Underground to mark the tube network’s 150th year. The work is inspired by the distinct colours of the underground lines and Qureshi has created intricate floral designs for each line, in a contemporary miniature style that borrows techniques from traditional Mughal painting. The artist, who participated in this year’s 55th Venice Biennale and has recently undertaken a commission for New York’s Metropolitan Museum of Art, is known for his conceptual works that combine abstract painting with the centuries-old Islamic art form.